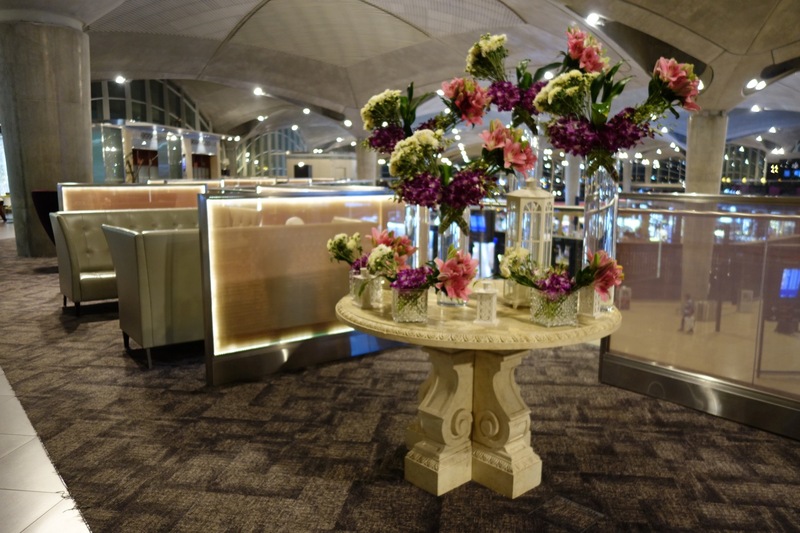 Royal Jordanian’s hub lounge in Queen Alia International Airport offers plenty of space to spread out and a great selection of Middle Eastern appetizers. You’ll find the lounge on the upper level of the main departures hall at AMM. Entrance is reserved for Royal Jordanian and oneworld business class passengers, oneworld Emerald or Sapphire members, and Priority Pass members. Looking up from the ground level, the lounge appears to be one large balcony stretching around the terminal and overlooking the Duty Free shops and gates below. I like the design very much. Beverage stations are strategically positioned around the lounge, including a wine bar, self-serve coffee, and plenty of soft drinks and fruit juices. The buffet includes great mezze items like tabuleh, labneh, hummus, and tasty mini beef schwarma rolls. Fresh salads, sandwiches, pastries, and breads. Other hot items include mozzerlla sticks, potato balls, and meat balls. You might think this lounge must get very crowded. After all, it is not only the lounge for the airport’s number one carrier, it is also a Priority Pass lounge. But I’ve visited twice, once in the early evening and once in the middle of night and both times the lounge was not crowded at all. Seating is varied throughout the lounge. Restrooms and showers (not pictured) are available. Showers cost 11JOD to use. Sadly, internet functions slowly. Bring along a converter if you want to charge your devices and don’t have UK-style plugs. I liked this lounge better than the nearby Petra Lounge, both part of the Priority Pass network. If you arrive hungry you can leave full, but this better to enjoy some excellent appetizers in this lounge and enjoy a heartier meal on your flight. Do you still have to pay to use the showers? I was told passengers needed to pay extra service fee for shower facility. Is it true? Agree with your assessment. Lovely lounge and each time I have been there it is kinda sad that there are not more people. It has the best coffee in the world. So does Central Cafe in Feankfurt. I have been to this lounge so many times mostly morning hours and sometimes around dinner time. The pictures here are clearly from the marketing department and not from the author of the piece. I have rarely seen any food items beyond starters (mezza mentioned here). The choice of food never changed through lifetime of lounge but staff attitude has certainly deteriorated. It gets super crowded with literally no place to sit if you want to eat. The bathrooms are outdated to a degree that toilet seats have cracks and holds in the plastic. I usually go to Petra lounge if I want a cleaner bathroom. RJ needs to up its game for the lounge and learn from regional competitors (other than Egypt Air). This piece here is marketing rather than review. Instead let’s ask RJ to improve its lounge rather than for a marketing piece. Ridiculous charge. I took all these pictures myself and have not been in contact with Royal Jordanian at all. I found the experience much better than you describe. I always use the lounge and the food is really good. A week ago, my flight was very early in the morning and the smell of the bakery was really inviting that I could not resist the freshly baked croissants. The staff continuously clean the tables and always around. However, I suggest a bigger screen for flights information to be installed. Priority Pass says entrance limited to 3hrs prior. Any truth to this? I doubt they’d come and find you inside that large lounge.